In medium bowl, mix together beef, soy sauce, 1 tsp cornstarch and sherry. Marinate in refrigerator at least 30 minutes. In small bowl, stir ¼ cup (50 mL) chicken broth, oyster sauce, and 2 tsp cornstarch. Set aside. In wok or heavy skillet, heat 1 tbsp (15 mL) canola oil over medium-high heat. Add half of garlic and half of ginger and sauté until fragrant, about 30 seconds. Add beef and stir-fry about 4 minutes, browning meat and cooling until no longer pink. Scoop beef onto a plate. Set aside. In wok or skillet, heat remaining 1 tbsp (15 mL) canola oil over medium-high heat. Tip wok to coat bottom of pan with canola oil. Add remaining garlic and ginger. Stir-fry until fragrant, about 30 seconds. Add broccoli and sauté for 1 minute. Pour in 1/3 cup (75 mL) chicken broth and cover wok or skillet. Cook for 3 minutes. Remove lid and cook until most of liquid is evaporated. Add red peppers and cook for 1 minute. Add beef. Stir sauce, making sure cornstarch is dissolved, then add to beef and broccoli. Cook until sauce is thickened, about 2 minutes. 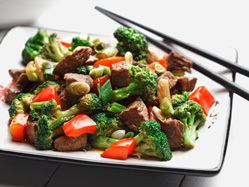 Stir occasionally to coat meat, peppers and broccoli with sauce. Sprinkle in green onions and cook for another minute. Serve immediately. Prep Time: 10 min. Cook Time: 20 min. Servings: 4 Source: www.heartandstroke.com (recipe provided by CanolaInfo.org).